This Case Study is published by the Make WordPress Marketing Team. Provided by DigiSavvy, a full-service digital agency in Los Angeles. 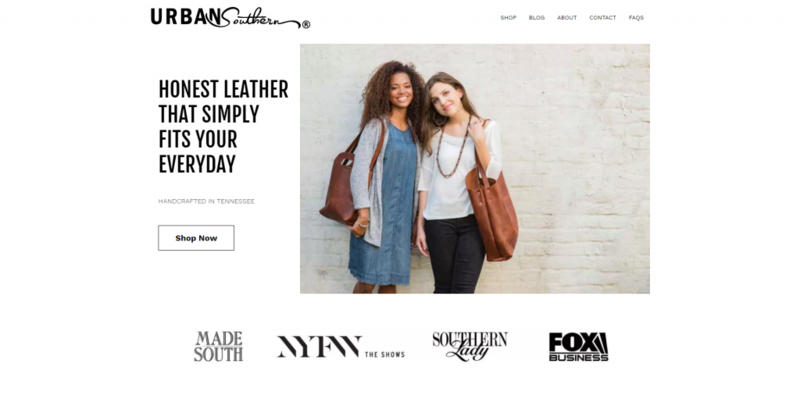 Urban Southern knew that if they wanted to make a real run at being successful with their handcrafted leather goods retail website, they would have to level the playing field with their competition. Their existing website was running on an older Content Management System and the eCommerce solution in place was just not flexible enough. The site was not providing the company with any sales conversions, which eventually forced them to seek professional assistance. Over a period of two years, they had amassed a mere total of just ten sales. One of the biggest challenges of the project was the amount of time they had to completed it. Having only a minimal budget, the odds seemed to be stacking up against them. It was the first week of November and they insisted that their new site be ready by Black Friday, which was just about three weeks away. The primary goal was to have a flexible solution that would allow them to create solid marketing strategies to promote their product lines. Ultimately, this translated to a need for a blog to work with the store and the ability to extend those aspects in the future. Another requirement was the ability to update and manage the site themselves as well as ensure that the platform was user friendly. The staff at Urban Southern was well versed in crafting fine leather goods, but the technical details of selling those goods online has been an unpleasant and exhausting venture for them. Urban Southern wanted the ability to easily add content to assist in their marketing strategy, an easy to use interface, and a scalable product with room to grow in the future. They also wanted to ensure it was up to date with SEO standards, so their marketing attempts were not in vain. With all the required functionality easily handled within the dashboard, WordPress just made sense. With the open source licensing and flexibility offered with plugins like WooCommerce, DigiSavvy was confident they could produce a quality site to launch in time for the big sale. Since the group already experienced such a heartbreaking beginning online, the goal was to help them launch their new site with momentum. The staff at Urban Southern was prepared to buy content aimed at promoting their business which would help drive their search rankings. They also needed the site to be accessible for both them and their target audience. One of the biggest obstacles faced in this situation was the lack of development time that could be allocated, since there was only a few weeks to design, develop, and test the site before its launch on Black Friday. In the end, DigiSavvy was able to build Urban Southern a brand new storefront using WordPress, Beaver Builder, and a custom designed WordPress theme. This was a complete design starting from a graphical mock up, utilizing WooCommerce to drive the retail portion of the site. With the obstacles mentioned previously in mind, it was decided that Beaver Builder would be used for this project, which helped rapidly produce the information pages and offer a user friendly tool that could easily be passed to the client when the job was completed. The new website allows for easy and quick creation of beautiful landing pages and as a result, sales have steadily risen since their site launch. The new website is also SEO and mobile friendly, which were two key factors missing from their previous website solution. With the new WordPress website and its easy to use interface, Urban Southern now has the ability to create high quality content quickly and frequently. This has drastically improved their rankings, bringing them the online business they desired. The site launched in time for Black Friday and Urban Southern experienced their best sales day ever. Since that time, their lowest month of sales has been 49 orders and their sales and website stats are constantly improving.